E-zines or online fanzines have grown increasingly popular as a way of offering edited and formated fan fiction to fans at low or no cost. Early e-zines were often distributed as text files as part of a mailing list, basically collecting online stories into a single document. Other e-zines started off as print fanzines, but switched to electronic mode due to lack of interest in the printed format. This was most typically the case for letterzines or newsletters. For example, the Pern fanzine Out of the Blue switched to both electronic and print formats in 1995. A few e-zines that started as a free email newsletters also offered a paid mail version. The Starsky & Hutch e-mail newsletter Black Bean Soup was also available by mail for a nominal fee from 1994 to 1999. By 1998, most subscribers were online and were obtaining copies of Black Bean Soup through email or download. It is not clear when the first ezine was published but in 1996, Blake's 7 fans created the Aquitar Files, an online "webzine" that offered fan fiction in a www format. Also, in 1996, fanzine distributor Bill Hupe began offering what he called "D Zines" - zines in Adobe Acrobat PDF format. Irrespective of when they were first offered, e-zines for pay may not have become more common until early 2002 when a Star Wars: The Phantom Menace publisher offered Noumena on a CD for $10 US (including shipping). The CD version, offered in PDF format, included new art by Moonshine. One of the reasons e-zines are often offered in PDF format is in order to preserve art and design layouts. Layout preservation is important to some publishers like Oblique Publications. Other fanzines are designed to be read solely online via a web browser. Pages are shortened to be more easily seen on the smaller computer screen and art is integrated throughout the text. As more and more fans migrate to e-readers, fanzines may one day be offered in Kindle or e-book friendly formats. Between 1996 and 2001, many publishers debated whether to sell their print fanzines in electronic form. Most felt uncomfortable with offering e-zines for download when so much fan fiction was available for free online. Limiting access to and distribution of downloaded e-zines was also an issue. And, it is possible that the fannish market at the time would not have supported downloaded ezines. Instead, the main distribution model fell into two categories. A CD offered for sale in connection with or at a lower price alongside the print zine. This was seen by some fans and fanzine publishers as a way of allowing international fans to enjoy fanzines without paying for high mailing costs. The other method was to offer only a CD version. The CD-only version was also a popular option once a print zine went out of print. These CDs were occasionally sold at a lower cost. In later years, fanzine publishers sometimes chose to offer the PDF version of the zine online for free once it went out of print. See Serge Protector for an example. During those initial years, fanzine editors experimented with many forms of CD distribution. In April 2002 YS McCool offered her her Sentinel Cheyenne stories, which had appeared previously online, on a CD with all the graphics and pictures along with a new story for $10 (including shipping). However because the fan fic had been offered for free online, many did not consider it an ezine. And in once instance, when Starsky & Hutch fan TLR removed her fan fiction in May 2000 from the Starsky & Hutch Archive to later offer it for sale between $10-20 per disk, many in the fan community were less than supportive. In fact, the pricing of the initial e-zines raised a few eyebrows. On the Zinelist, one fan ran initial calculations and estimated that the production costs (including free contributor copies) came to only $3.65. The cost for mailing a CD at the time was $1 so that even with a 20% markup to cover additional costs, the total cost should not have been more than $6 for a US shipped CD with a printed label and color insert. Fanzine publishers responded by pointing out that they incurred website costs, had to pay for their own computers and Internet access and that accepting credit cards meant they took a smaller cut. For many fans these arguments were not persuasive. Complicating matters where that many publishers/editors merely burnt their word processed zine files to CD in PDF format without including their special fonts on the disk. This threw off formatting of the PDF version, making the CD zine an even less attractive purchase. Pricing for zines on CD has remained relatively steady. As of 2013, Requiem Publications offers most of its print zines as optional CDs for $12 including shipping. In Nov 2003, The Ka-Mnemon of Obi-Wan Kenobi, a Lover's Journal was sold as a paper zine in combination with a CD in PDF format for $22 plus shipping. In June 2004, Blackjag Publishing was one of the few publishers to offer CD zines in formats other than PDF (they offered "self-contained HTML-based .exe and Palm OS .pdb file. Rocket eBook .rb upon request" plus shipping.In September 2005, the Star Trek zine Beyond Dreams #8 was offered on an optional CD for $10. However, in 2009, one fanzine publisher, after selling out of print copies, advertised their fanzine's availability as a PDF file ("$20.00 download or $24.00 CD mailed anywhere in the world -- the higher price includes agenting fees"). The email was forwarded to the TSstoryfinders Yahoo Group in February 2009, prompting discussion both on-list and off regarding the question of selling fanfiction for profit. (See Profiting from fanfiction). More info is also available here. In 2004, Ancient's Gate may have been one of the earliest zine publishers to offer PDF zines as downloads. They were $8. Requiem Publications began offering PDF downloads in 2008 for $8 per zine. To date, few zine publishers have offered fanzines in more tablet friendly formats such a .mobi or .epub. Prices for downloads may be falling. In 2012, Jean Kluge lowered the prices for Changes and Pulse of the Machine to $5 and $7.5 respectively. This price included both PDF and mobi file formats. In a recent discussion about paying for downloaded one fan said she'd be more liley to pay for an epub zine that was nicely formatted and that "My current rule is that I don't pay more than $6 for fiction ebooks; I should probably reconsider that, but I don't expect to ever pay more than $10, and I won't pay $3 for a short story." "I've emailed [her] to complain. If they are making a profit - which I strongly expect that they are - then unless they have permission from MGM, they are doing something illegal. Let's see what they say in their reply - if they reply at all! I also think it is particularly repulsive that the first part of the series is free....."
"Why have private groups and horrendously expensive zines and endless waiting? I would never jump all these hurdles to read a fic. It goes against everything that fandom's about for me." To add to the complexity, some print fans feel that e-zines are not "real" zines. 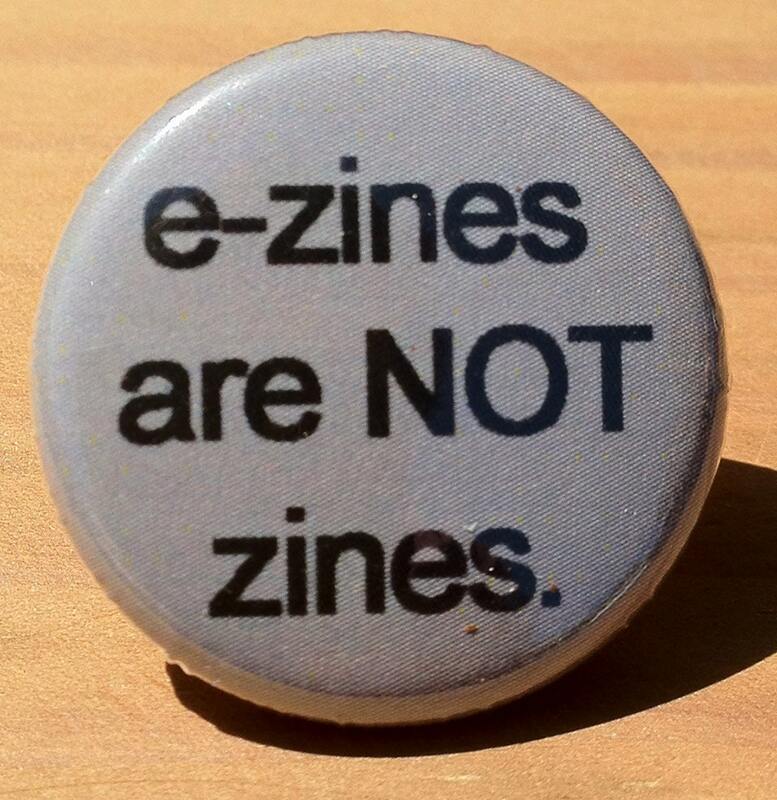 See Ezines are not zines button for sale on etsy. The button seller writes: I'm a zine purest, maybe you are too? Zines are printed objects, not digital 1's and 0's. Not to say I don't like blogs or the internet, just don't call them zines. More recently, ezines have been taken up by a newer generation of fans, ones who do not feel it is permissible to charge for fan fiction. These ezines are usually one offs, created by a loose collection of fans who gather for a specific publication. Examples include Earth and Sky (Batman), Chocolate and Asphodel, a Harry Potter zine and Universal Constant (Star Trek (2009). For a list of e-zines on Fanlore click here. ↑ For example, in February 2000, Flamingo asked the members of the Venice Place mailing list if they'd be interested in buying a zine via CD. She was still asking the same question in 2013. ↑ link to ordering page. ↑ Poll/Question From A Fanzine Publisher: The Future of Zines dated Aug. 21st, 2013; reference link. ↑ comment in the Grr post on LJ dated June 23, 201;reference link. ↑ WebCite for text; WebCite for button image (accessed May 21, 2013). This page was last modified on 13 September 2018, at 15:25.